Formula One impresario Bernie Ecclestone has appeared in court faced with charges of bribery. Ecclestone, 83, stands accused of paying around £27 million of bribes to German banker Gerhard Gribkowsky. It's alleged that in return for Ecclestone's payments, Gribkowsky facilitated the sale of the Formula One outfit for a significantly reduced price to private equity firm CVC Capital Partners, which had agreed to keep Ecclestone on as CEO. Constantin Medien, who was a shareholder in Formula One at the time, stood to gain a sizeable commission from any sale which valued the business at over £620 million. He has accused Ecclestone and three co-defendants of deliberately undervaluing the sport during the sale, causing him to lose out. Ecclestone, however, says that Gribkowsky was threatening to make false allegations about his tax arrangements to the Inland Revenue, and that the payments were to ensure he kept quiet. 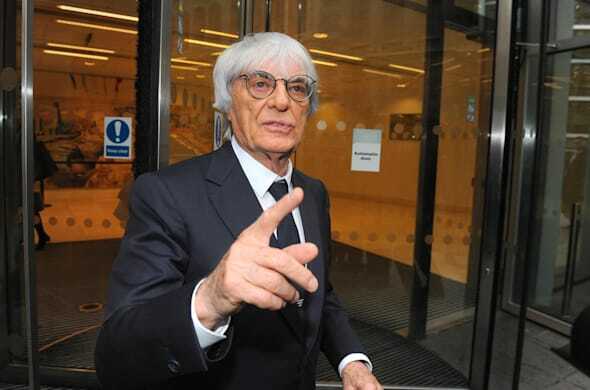 Ecclestone arrived at court in a bizarre manner, seemingly getting confused by a revolving door on the way into the building and re-emerging into the open air. He was then allowed to enter through a 'normal' door to one side. In court, there were sharp exchanges between Ecclestone and Philip Marshall QC, acting for Medien. At one stage, Marshall accused Ecclestone of "fabricating" evidence about consulting an in-house accountant rather than a lawyer over the supposed blackmail, and asked why he hadn't gone to the police. Ecclestone, however, claimed that he would have paid a similar amount to anyone who might have tried to extort money from him by claiming that he had cheated on his ex-wife. When asked by Marshall if that was really true, he quipped: "You haven't met [her]."